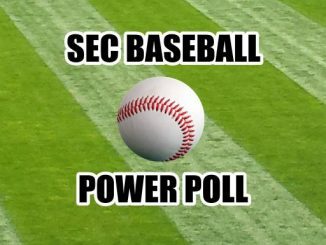 A few weeks ago, the gap between the Kentucky Wildcats and the SEC-best Tennessee Volunteers seemed immense. 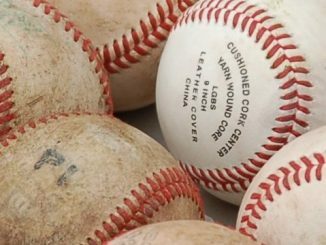 In Knoxville, one could see a well-rounded team which had many ways to beat opponents. 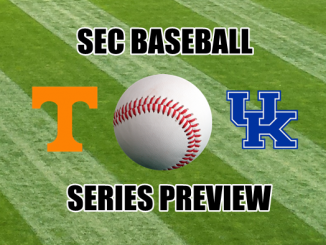 Tennessee could outscore the opposition if needed but could rely upon its defense, rebounding, and cultivated toughness to grind out wins when the going got rough. The Vols could flourish from the perimeter and in the paint. Their frontcourt could score, their backcourt could facilitate, and vice-versa. Tennessee made itself into a textured, adaptable team with a roster full of important contributors. No. 1 or No. 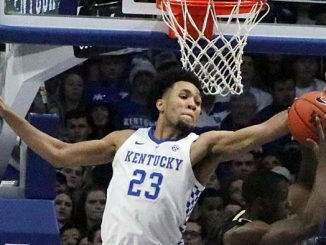 2 seeds in the NCAA Tournament have those kinds of teams, and at the start of January, Kentucky wasn’t especially close to becoming that team. Near the end of January, it’s a very different story. 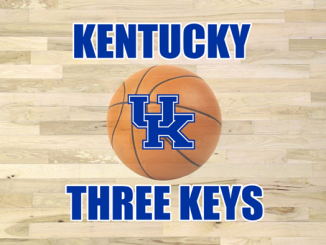 It was known that midway through this month, Kentucky’s frontcourt needed to step up. Reid Travis, P.J. Washington, and Nick Richards all needed to be there on a more regular basis for their backcourt teammates and for John Calipari. Richards still lags behind his teammates, but he at least makes his presence felt to some degree. As for Travis and Washington, they have both elevated their games, especially against Auburn and Kansas on consecutive Saturdays. As a result, Kentucky’s roster now gets at least four solid individual performances per game. This is no longer the team which got lost for extended stretches each game. This is no longer the team which could not lock down opponents when the UK offense was struggling. This is a team which has clearly evolved beyond the limitations of the 2018 group, which often needed Kevin Knox to shoot the lights out or have Shai Gilgeous-Alexander dominate the ball. One can see that Kentucky is approaching the Tennessee standard of balance and versatility. 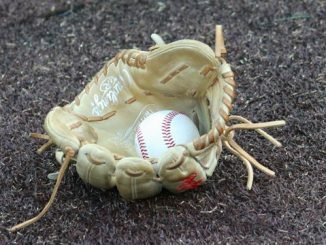 Big Blue is developing the ability to win with different qualities and a mixture of resources. 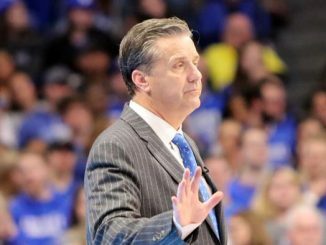 There are still flaws on this team, but whereas Kentucky had not yet formed a strong identity at this point last season and needed the whole of the month of February to get a sense of how it needed to play, this team has its identity. It needs Richards to improve so that the frontcourt has a third dependable presence. It needs to find moderately competent perimeter shooting – not dazzling, but decent enough to earn the respect of opposing defenses. Kentucky isn’t all the way there; this isn’t yet a complete team. However, it is close and getting closer. Such is the state of the Cats after a hard-nosed 71-63 win over Kansas in Rupp Arena. Look at the distribution of roles and contributions on this team. Richards, though playing only nine minutes because of his inadequacy at the offensive end, blocked five shots against Kansas. 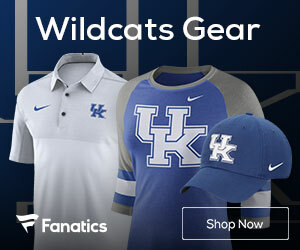 Richards is part of why Kentucky is No. 11 in the country in blocked shots, an engine behind this team’s defensive prowess. Kentucky’s size and length made the difference for Big Blue against Auburn, and they did much the same thing against Kansas. That’s one way Kentucky can win games. Another way for UK to win is with perimeter defense. Ashton Hagans reminds basketball fans and coaches everywhere that points aren’t the measure of a player. The freshman guard is averaging three steals per game in his last five games. He is a defensive terror who chokes off driving and passing lanes and brings opposing offenses to their knees. 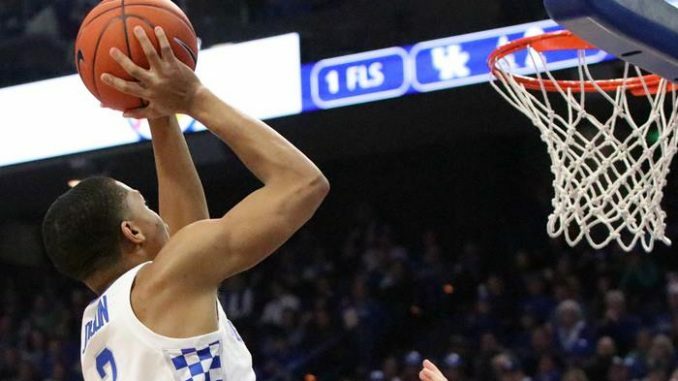 Keldon Johnson is giving Kentucky a little bit of everything, representing this team’s evolving multidimensional character. He isn’t a volume shooter, but he has hit at least 50 percent of his field goal attempts in four of his last five games. He plucked 10 rebounds against Kansas and hit three treys. Then notice what Travis and Washington are doing. 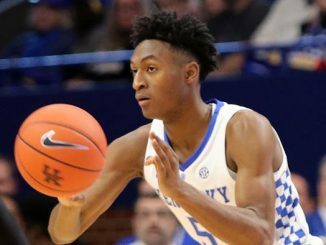 Travis has needed time to find his footing on this team, and Washington – who has been challenged by Calipari to be more consistent every game and every week – is beginning to become the rock Kentucky needs him to be. The two bigs took advantage of a Kansas squad which was playing without Udoka Azubuike and Silvio De Sousa. Travis went for 18 points and 12 rebounds against Kansas, while Washington posted 20 and 13. Their combined field goal shooting line against the Jayhawks: 14 of 28, a crisp 50 percent. Kentucky shot only 39 percent from the field, but Travis and Washington gave UK its most efficient sources of scoring, partly because they won 10 offensive rebounds and enabled Big Blue to register a 17-9 advantage over Kansas on the offensive glass. Another way for this team to win is foul shooting – at least, it came to the forefront on Saturday. Kentucky earned 12 more foul shots than Kansas and made nine more free throws in a game it won by eight points. That’s pretty significant, and the differential against the Jayhawks showed how much more physical the Wildcats were. They needed to pound KU into submission, and they did just that, a key point being the backcourt’s ability to smother Kansas’s perimeter shooters. The Jayhawks hit just 36.5 percent of their field goals. Kansas needed Lagerald Vick to bust loose, but Kentucky held him to just 10 points, more than enough to secure a resume-boosting win. 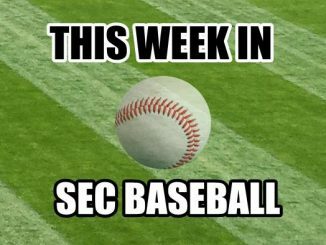 Kentucky has steadily moved closer to Tennessee’s standard with each passing week. 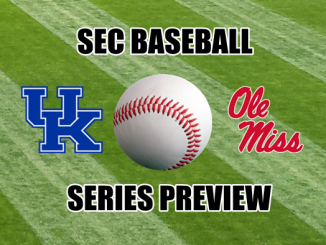 If the Wildcats keep improving and can reduce the severity of their flaws, they might be able to topple Tennessee and fight past the Vols for the 2019 SEC championship.